The name Sebastian became widely used because of a third-century saint called Sebastian. He was martyred for being a Christian by Emperor Diocletian, whose first attempt of shooting arrows at him didn’t kill him. Saint Sebastian went to see the Emperor again in hopes of admonishing him, but he was beaten to death. Later, the 16th century King of Portugal also bore the name. He died in a crusade against Morocco. Sebastian Kurz – The Chancellor of Austria. Sébastien Loeb – A rally car driver, 9 times world champion. Johann Sebastian Bach – Music composer. Although his Sebastian is a middle name, music lovers have come to love the name because of Bach. Sebastian Vettel – German racing driver, a four-time Formula One World Champion. If you are a lover of the literary arts of books and media, then there are some beloved fictional characters that you will surely remember. Below are prominent television movies, drama series, and novels that had a very memorable Sebastian in it. Blade Runner 1982 – The protagonist was known as J.F. Sebastian. William Shakespeare’s play “Twelfth Night” – Sebastian is one of the main characters in the play. Carrie Diaries – A series where Carrie’s love interest is Sebastian Kydd. Revolution (2012-2014) – Bass Monroe, the nickname of Sebastian Monroe, the fictional President. Sherlock Holmes – The villain called Colonel Sebastian Moran. Nicknames for Sebastian has been divided into three categories. Popular Sebastian nicknames contain the cool and the cute, unusual Sebastian nicknames contain strange nicknames, and female Sebastian nicknames contain the feminine variation of the name. Sebastian has remained in the 100 most popular boys name across many countries. In 2006, it was the 5th most popular name in Chile, 59th for boys in New South Wales, Australia, 13th in Norway, 38th in Sweden and 86th in England and Wales in the following year. In 2008, the name Sebastian ranked 98th in the United States. It ranked number 20 in the year 2016 and currently ranks 10th most popular boy name. This section carries the unusual nicknames for Sebastian. 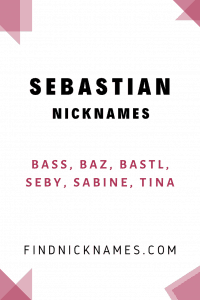 You will find the strange, funny, creative, weird and even maybe offensive nicknames for Sebastian. It is the section that is far from the traditional, common and usual nicknames that you know already. If you like something different, you will find it here. There is no female version of Sebastian in the real sense. It is considered a boy name; however, it is the trend these days for a female to bear male names. If you are one who is not comfortable with that and are traditional at heart, we have found feminine interpretations of Sebastian in other languages. Below are names and nicknames for your lady. If you know how to come up with nicknames, you can come up with endless unique Sebastian nicknames. 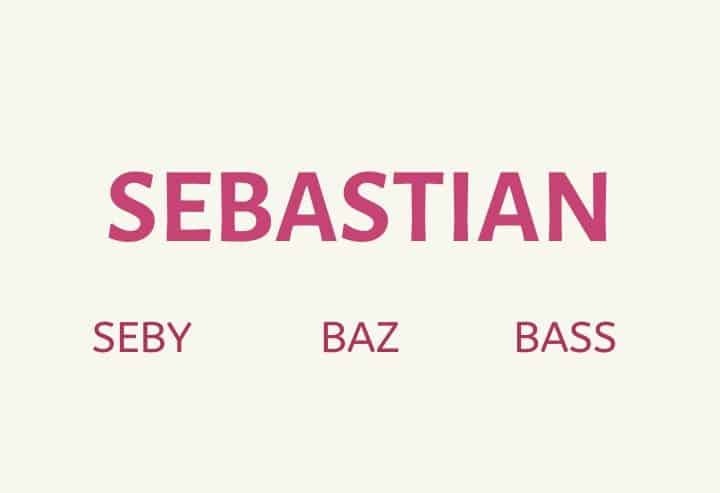 Also, if you know any good nicknames for Sebastian that we didn’t mention, be a dear and drop in the comments box.